(Nanowerk News) The National Nanotechnology Coordination Office (NNCO) is pleased to announce the launch of a workshop report and a web portal, efforts coordinated through and in support of the Nanotechnology Signature Initiative 'Nanotechnology for Sensors and Sensors for Nanotechnology: Improving and Protecting Health, Safety, and the Environment' (Sensors NSI). Together, these resources help pave the path forward for the development and commercialization of nanotechnology-enabled sensors and sensors for nanotechnology. 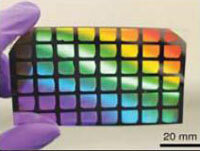 Image of a fully integrated chemresistive microhotplate array gas nanosensor. (Image: NIST) The workshop report is a summary of the National Nanotechnology Initiative (NNI)-sponsored event held September 11-12, 2014, entitled 'Sensor Fabrication, Integration, and Commercialization Workshop.' The goal of the workshop was to identify and discuss challenges that are faced by the sensor development community during the fabrication, integration, and commercialization of sensors, particularly those employing or addressing issues of nanoscale materials and technologies. Enhancing communication among researchers, developers, manufacturers, customers, and the Federal Government agencies that support and regulate sensor development. Leveraging resources by building testbeds for sensor developers. Improving access of university and private researchers to federally supported facilities. Encouraging sensor developers to consider and prepare for market and regulatory requirements early in the development process. In response to discussions at the workshop, the NNI has also launched an NSI Sensors web portal to share information on the sensors development landscape, including funding agencies and opportunities, federally supported facilities, regulatory guidance, and published standards. Ongoing dialogue and collaboration among various stakeholder groups will be critical to effectively transitioning nanosensors to market and to meeting the U.S. need for a reliable and robust sensor infrastructure. On Thursday June 25, 2015, from noon to 1 pm EDT, NNCO will host a webinar to summarize the highlights from the 2014 'Sensor Fabrication, Integration, and Commercialization Workshop' and to introduce the newly developed Sensors NSI Web Portal. The webinar will also feature a Q&A segment with members of the public. Questions for the panel can be submitted to [email protected] from June 18 through the end of the webinar at 1 pm EDT on June 25, 2015.